What brought you to IIRPS VU? Why did you pick Vilnius? At first, I applied for the Master’s programme of International Relations and Regional Studies at the University of Tartu, but I was rejected. In October 2016, I took an online course – EU Eastern Partnership: from Vilnius to Riga Summit. After that, I looked for information about Vilnius University online and found this study programme, Eastern European and Russian Studies. I am very grateful to Vilnius University for providing me with this opportunity. You have a Bachelor’s degree in history, but just defended your Master’s thesis in political science, why did you decide to change your field of interest? First of all, I believe that history and political science are inseparable because it’s hard to understand some political issues without the basic knowledge of history, especially the modern history and contemporary history. As for my case, during the third year of my Bachelor’s study, I met a lecturer who was doing her PhD research in Diplomacy and Politics of Central and Eastern European Countries. Under her guidance, l moved my focus to this region. You were awarded for the best Master’s thesis in Eastern European and Russian studies programme, can you tell us more about the research you‘ve done? The title of the thesis is “Polish Energy Security: Between Vulnerability and Diversification”, which focuses on the current situation of Polish energy sectors based on the IEA’s short-term energy security model and how to improve the energy security in the long-term from 4 aspects: development of renewable energy and shale gas, construction of nuclear power plants, diversification of import resources. I have met many excellent lecturers during my studies at IIRPS. Such as my tutor, Dr. Nerijus Udrenas, who can always give useful advice on my research, and Vilius Mackinis, he’s very patient in answering every question about Master’s thesis. In the second semester, I took a course on energy security and I benefited a lot from Romas Švedas’s lectures. Probably I would not have been able to get the award for the best Master’s thesis without their suggestions and help. 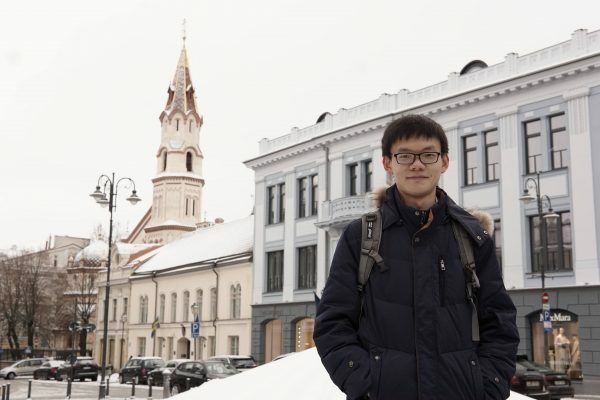 Can you compare the experience of studying in China to studying here in Vilnius? In China, basically, the educational activity built on the unitary teacher-centred pattern from primary school to Bachelor’s study and the students rarely participate in the discussion. However, we are encouraged to express our opinions here and the lecturers never criticize you. Now, I’m more willing to participate in the teamwork and express my own opinions publicly. I’ll do an internship as a Research assistant at the Institute of International Relations, Prague (IIR). I hope to continue my PhD studies there and focus on researching China-EU relations. Is there anything you would like to wish your fellow students and the entire community of IIRPS VU? I wish all of the fellow students good grades and the for the institute to attract more talents to study and exchange here.